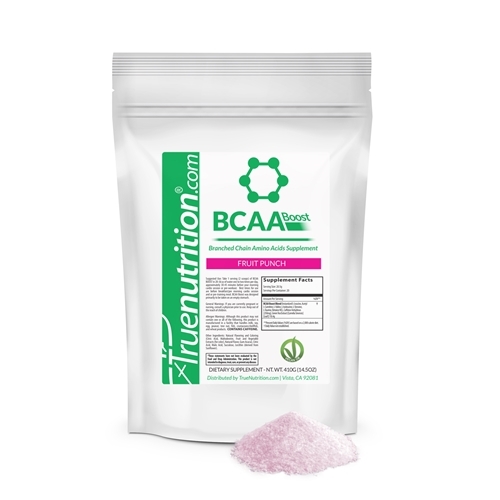 BCAA Boost is a powerful blend of amino acids and synergistic dietary supplements that has been designed to help support increased energy, endurance, and mental focus throughout your workout.✝ Combine with True Nutrition's EAA Plus and your favorite protein powder to form the perfect pre-, during-, and post-workout stack! As a dietary supplement, take 1 Serving (About 2 Scoops) in 18-24 fl oz of liquid once daily approximately 15-30 minutes prior to exercise. BCAA Boost Proprietary Blend (L-Leucine, Acetyl L-Carnitine, L-Isoleucine, L-Valine, L-Tyrosine, Taurine, Betaine HCL, Caffeine Anhydrous [250mg], Green Tea Extract (Camillia Sinensis L.)(Leaf)). Natural Flavors and Colors, Citric Acid, Malic Acid, Sucralose, Lecithin (Sunflower). Been using this routinely for 5-6 years at least. I RARELY workout without it. Good for a pick me up to get through the day. The only reason it did not get a 5 stars is because of the taste. I wish they had more flavor options besides fruit punch . I thoroughly enjoy BCAA Plus but find this one lacking. I wanted this for an afternoon pickup on non training days. The taste is not there the same. I also don’t really notice the caffeine. I now prefer to mix a little NDure with the regular BCAA Plus for a similiar but better product. I absolutely love this product. It is like Buzz Saw but without any carbs! I love it.